A new addition to both Society and Corrections the first time ever to care about both. If you’re looking for a new beginning and a chance for rehabilitation "Congratulations" you don't have to look no further. 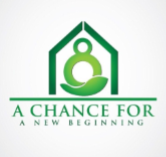 At A Chance For A New Beginning(ACFANB) we’ll give you a chance to reach out for help by giving you the attention and personal service you’ll come to expect and enjoy to begin your new future. We offer Halfway/Recovery Houses,Housing for Low Income,Rehabilitation,Helping the Homeless,Assistance with job placement,and a chance to give back to society what has been taken away or lost. Our employees are friendly and will be there to help you every step of the way. A Chance For A New Beginning is located in Beaumont,Texas. We are a Non-Profit,Faith and Non-Faith Organization.